Why Do We Bother? — Word-Strong Why Do We Bother? Optical illusions are fascinating. From the illusionary designs of MC Escher to those squiggly line prints with some hidden image. Illusions can also be frustrating. You look and look and look, but just can't figure it out. How about the classic lost in the desert movie? Someone with tattered clothing and dying of thirst crawls through the sand towards a mirage thinking it's water. Of course, it's only heat waves that appear as rippling water. The endless cycle of everyday life can seem illusory. As if, no hope exists of any break or improvement in the monotony of the mundane. That's when we need to see beyond the illusion. What is seen and lamented upon as a tragedy? What common pursuit seems to elude people living on the earth? What seems to be like "trying to catch the wind"? Why do you think this expression is used so often in Ecclesiastes? In all that's said about "pointless" talk, who do you think is stronger than us "mortals"? 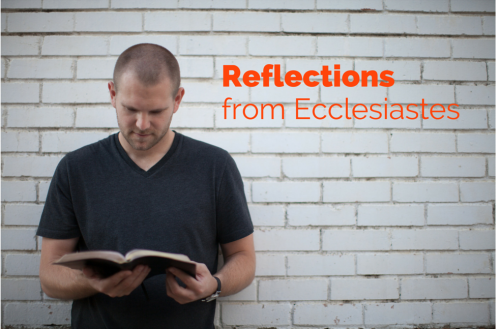 One of the difficulties in reading through Ecclesiastes is how it reinforces a sense of hopelessness to life. Many people throughout the world struggle with hopelessness. Some take their own lives because they lack hope. Yet, throughout refugee camps and impoverished or oppressed areas people can be found who hang tenaciously on a hope that things will get better. These are people who have little to nothing to hold in their hands, and who don't know if they will eat much in a given day. It is often affluent people who struggle most with depression and suicidal thoughts. Why? Every person wants meaning in life, even those most cynical among us. We need hope more than things. We want significance in life rather than fame and fortune. When we find ourselves lost in the illusion of hopelessness, it's time to look to the One above it all—God. What one thing seems to lead to a sense of hopelessness in your life? How do you cope with the routine of life? Do you like it or struggle with it? What are ways you find solace and hope within the mundane routines in life? How do you see beyond hopelessness and cynicism, or are you able to do so? Newer PostRemember the "Good Old Days"?